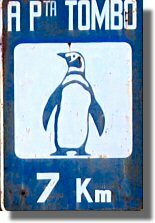 Tea, gas and many more penguins. We read that in Gaiman (in Argentina) it is cool to speak Welsh. The British Welsh Office even pays for Welsh teachers to come here and provides language scholarships in Wales. As well as being cool, it is good for tourism. The Welsh influence dates back to 1865 when 150 settlers founded Puerto Madryn (named after the Welsh nobleman who paid for their passage), however they quickly moved to Gaiman because the land was more fertile. Now they run tea shops for tourists. All in the best possible taste. The cakes were good. Unless you are planning a campervan trip in South America, you may want to skip this section! All three vans (K-Nine, Mel and Mog) use gas for cooking and diesel for heating (for any USA readers, by "gas" we mean propane/butane not "gasoline"). K-Nine has a large gas tank permanently mounted underneath and uses gas for a hob and oven. Mel has a smaller permanent tank and a gas locker that takes two 10/12 kg gas bottles. Unlike K-Nine and Mog, Mel has a fridge that uses (a lot of) gas when stationary. Mog has two 6 kg gas bottles, one of which is coupled to an external connector so it can be filled at most LPG stations. Mog only uses gas for a hob and uses about 1kg per month. In countries that use LPG for vehicles all three vans can fill up relatively easily. However in Argentina the gas used for vehicles is CNG (compressed natural gas) not LPG (liquefied petroleum gas i.e. propane/butane). Today Mel needed more gas, so in the absence of LPG fuel stations we tried a gas bottle (cylinder) re-filling station on the outskirts of Trelew (S43.258542 W65.346060). 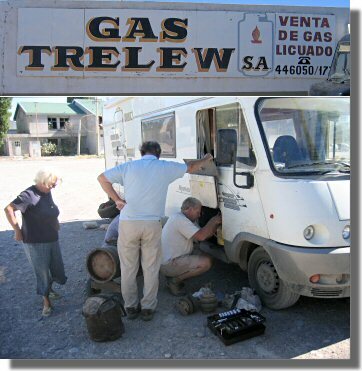 Unlike many re-filling stations that will not deal directly with the public, Gas Trelew was very helpful, though not entirely successful. They were prepared to try and fill both K-Nine and Mel's tanks from a large portable cylinder, but were unable to make the connection. They succeeded in filling one of Mog's cylinders using a European adaptor and a rubber bung. They were unable to fill Mel's cylinder (purchased in Brazil) but did supply a new Argentinian cylinder that fitted in Mel's gas locker and worked with a regulator they had bought in Bolivia(?). Naturally they charged for the new cylinder and Mel had to abandon the empty Brazilian one. Because the deposit on cylinders in South America is so low and because matching regulators are sold in many supermarkets the "get a new cylinder when it runs out" approach is quite viable. After leaving Trelew we made a 300km detour from the boring R3 to follow the minor coastal road south via Punta Tombo, Cabo Raso, Camarones and Cabo Dos Bahias. Both Punta Tombo and Cabo Dos Bahias are breeding grounds for Megellanic penguins. 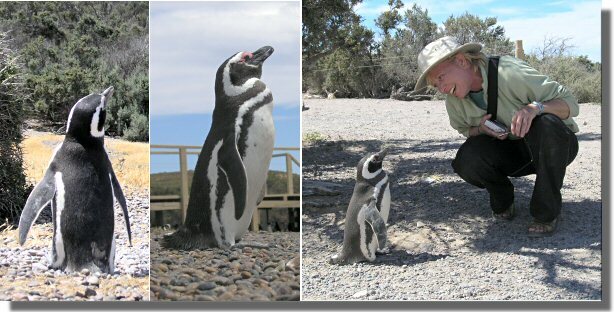 Punta Tombo is the largest breeding colony in the world with 175,000 breeding pairs and a fair number of tourists. Cabo Dos Bahias is considerably smaller with very few tourists. At both colonies the penguins are so used to tourists that you have to be careful not to trip over them. As Judy discovered, most of then do not speak English. Camarones is a surprisingly attractive little town, famous for its annual salmon fishing festival. It also has a basic camp site, a fuel station, mini-market and more surprisingly wireless Internet access in the street outside the Indalow Inn ($3USA per day, ask at reception).